Nongshim’s Neoguri made its debut in 1982 and gained popularity for its thick Udon-style noodles and distinct spicy seafood flavor. 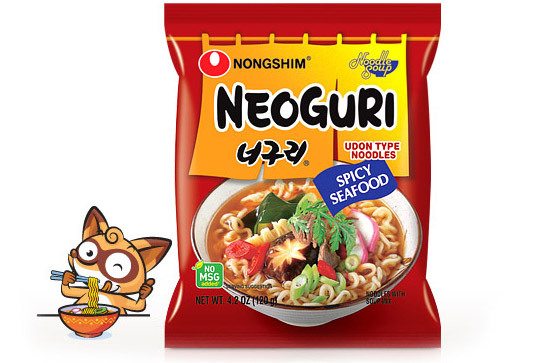 Many years have passed since then, but Neoguri continues to be made with real seafood ingredients, and remains one of the most popular of Nongshim products. Thirty years and going strong! Up until the release of Neoguri in 1982, Korean ramyun noodles had always been thin. So when Nongshim released Neoguri, customers immediately took notice of its unique thick noodles, which had a more pleasant texture than other noodles on the market. It was also known for its combination of warm spiciness and rich seafood taste. This is because Nongshim uses the best ingredients around, including seaweed collected in waters around Wando in South Jeolla. The release of Neoguri was the start of a new era for Nongshim, and was the first of Nongshim’s four mega-hit brands to change the Korean ramyun landscape. It was closely followed by the release of Ansungtangmyun in 1983, Chapagetti in 1984, and Shin Ramyun in 1986. Today, three decades later, these four brands continue to top the Korean domestic market. absorb the flavor of Neoguri soup well. Although they are thick, they do not stick to each other. 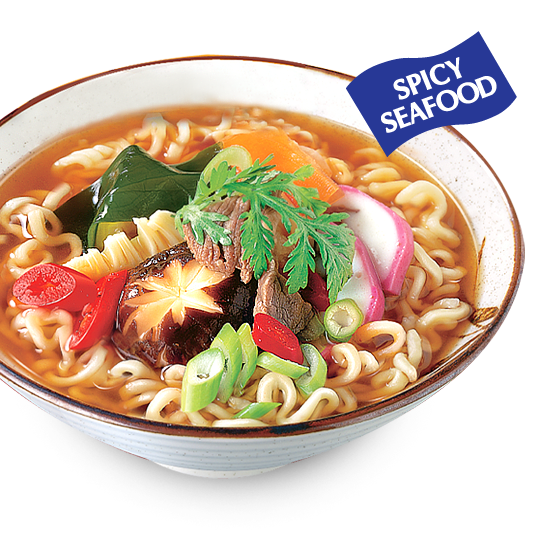 The delicious soup has a warm spicy seafood taste unrivaled by any other ramyun. Generous portions of dried kelp help give both texture and taste to the soup, adding a layer of flavor to Nongshim’s Neoguri. Kelp is full of minerals essential to the human body. It has more fiber than brown rice without high levels of starchy carbohydrates, and also contains high levels of magnesium, iron, iodine, and calcium. With all this in a low-calorie food, it’s no wonder many people are turning to kelp to improve their diet! 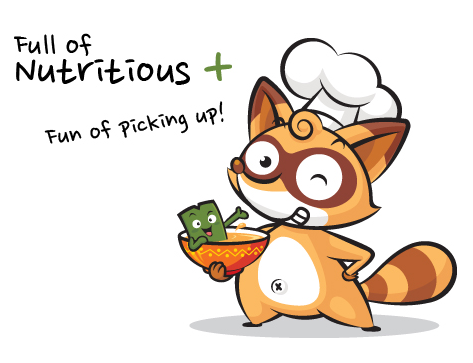 Nutrients: rich in high quality fiber such as alginic acid and minerals such as potassium and magnesium. Use: clear broth stew, tasty jeongol broth. Boil 550 mL (about 2 1/3 cups) of water. Add noodles, soup base, and vegetable mix. Cook for 4-5 minutes, stirring occasionally. Remove from heat and enjoy. Put soup base and vegetable mix into a microwaveable bowl, then add noodles on top. Pour 470 mL (about 2 cups) of room temperature water. Place a microwaveable cover on the bowl. Cook for 7 minutes. When using hot water, cook for 4 minutes.